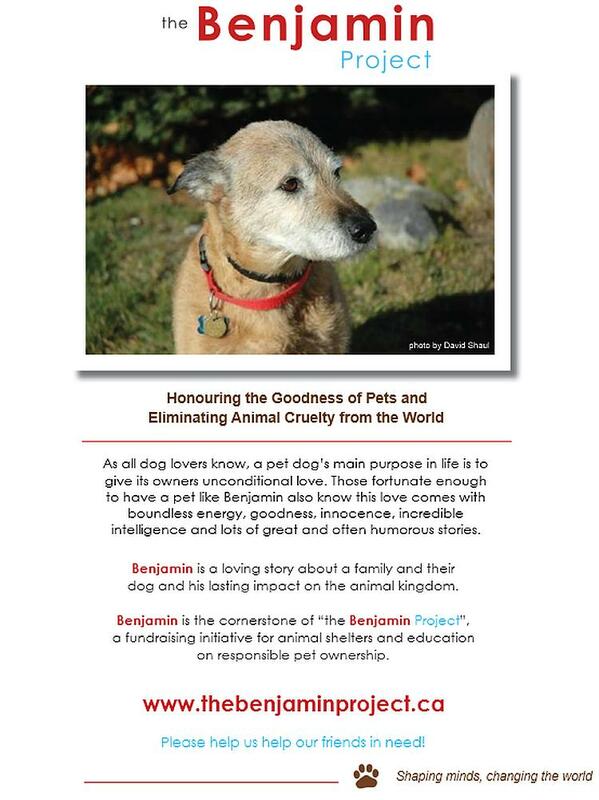 The Benjamin Project – Protecting the animals – a mission for all of us. ** All net proceeds from the Benjamin Project will go to animal shelters and to education on responsible pet stewardship. ** Buy the new Benjamin's book for children now ($19.95) by contacting the author at malcolmbernstein@sympatico.ca or 416-587-8590 to arrange for cheque or electronic funds transfer. I received your book from a friend of your sister , I am an animal lover I have always had a dog + started to rescue them 10 yrs ago. I loved your book and I totally could relate. I cried my eyes out at the end. I have 6 dogs right now and we leave our life with them in mind. We are very happy as they give us so much Thank you for writing the book and for all that you are doing to help protect animals from us cruel humans. Thank you Brigitte. This is very kind of you and very touching. I appreciate it. Please spread the word about the book and Project if you can. Wishing you and your 6 pooches the best! I have been an animal lover all my life, so it is not surprising that on several occasions I have met some pretty amazing animals…most of them, cats. I know that Benjamin was a wonderful dog, and that he brought his family great joy and happiness throughout his life. This is as it should be, and is no different for me. My latest adventure with my own little brown cat began in Peterborough, just over 10 years ago. She appeared one cold December night on my window sill. She had me with her enormous emerald eyes on that first night. Little did I know then, how our journey would go, and just how much joy and delight she would bring into my life. As it happened, she was very young, and in the coming weeks, apparently very pregnant. As her time grew near, I brought her in out of the icy February whiteness, and into my life. Margaux chose me, and so we became family..as we are still today. She is the smartest, most loving and devoted companion I have ever known. Her five beautiful children were born on my bed, during a howling blizzard that blew outside our warm and cozy space. She was only concerned with her new little lives…and I was bedazzled by this miracle before me. All 5 were unique and different, as was their small, beautiful mother. In short, she is my compass, my north star. …so wise, so all knowing, and yet, so small and light. Through life’s ups and downs we have traveled together, and will until the end. My darling girl saved me as much as I rescued her then. We are an unbreakable force, as anyone who knows her story will tell you. Those who are lucky enough to have one of her offspring also know just how special she is, and how fortunate they are to be a member of this extraordinary “club”. She is one in a million, and I do not exaggerate. I am sure she can read my mind, in every sense…her calm demeanour and fearlessness are legend. In closing, my words to all who read this and other comments are this. Never judge an animal by its appearance, nor its pedigree…that one serendipitous encounter may very well change your life. It certainly did mine. ..and I am forever grateful to have had this little brown cat in my life…may she live forever. Thank you Rachel for your beautiful, inspiring and poignant story. I am honoured you chose The Benjamin Project site to share it. Continued joy and love for all of you. I just read your children’s book, it came to me from Arlene Chan who lent it to a friend, who brought it to me to return to Arlene. What a fabulous book! I just keep thinking how awesome this book would be to give to people who adopt my foster pups (currently on #60). I foster for a group called Save me Dog Rescue and all of my pups have been Northern Breeds that come through Northern Reach Rescue Network. Northern Reach works with Northern remote fly in Communities to rescue dogs that are homeless, sick, overpopulated dogs and so forth. They fly them into Thunderbay to foster and or heal and then they are dispersed to various southern rescues such as Save me dog rescue. But Northern Reach does much more! Spay and neuter clinics, Northern feeding program (food is gathered here and 3-4 pallets are sent once per month to Thunder Bay) and rescue. Money comes by donations and by various fund raisers but it is always a struggle to stay afloat especially when it comes to vet bills. It would be awesome to speak with you about Northern Reach and the wonderful work that is being done to save our Canadian dogs from starving and unnecessary death.